If you are reading this blog post on a smart phone, there is a good chance that you are looking at a device that was made in Vietnam. Worldwide, one in 10 smartphones is produced in Vietnam. Mobile phones are Vietnam’s number one export, generating export revenues of more than $45 billion in 2017. This success is a symptom of a broader trend that defies global norms. While global trade has stagnated, Vietnam’s trade has soared to 190 percent of GDP in 2017 from 70 percent in 2007. While premature de-industrialization sweeps through the world economy, Vietnam’s manufacturing sector has steadily expanded, adding an estimated 1.5 million new manufacturing jobs between 2014 and 2016 alone. Why is manufacturing witnessing a renaissance in Vietnam, while relapsing in many parts of the world? Given the recent clarion call by several world leaders to create manufacturing jobs in their countries, Vietnam’s experience holds lessons for developing and advanced economies alike. Some basic foundations are clearly important. Wages are still low and demographics are favorable. About half the population is below the age of 35, and Vietnam has a large and growing workforce. The country is also politically stable and geographically close to major global supply chains. But this is not necessarily what sets Vietnam apart. Instead, we would argue that Vietnam managed to capitalize on its strong foundations through good policies. Vietnam has achieved its success the hard way. First, it has embraced trade liberalization with gusto. Second, it has complemented external liberalization with domestic reforms through deregulation and lowering the cost of doing business. Finally, Vietnam has invested heavily in human and physical capital, predominantly through public investments. These lessons—global integration, domestic liberalization, and investing in people and infrastructure—while not new, need reiteration in the wake of rising economic nationalism and anti-globalization sentiments. 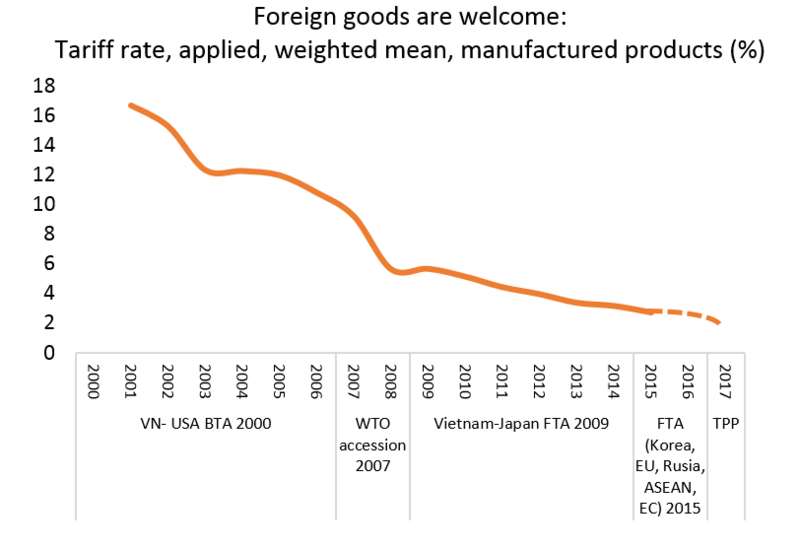 First, trade policy has arguably been the most important industrial policy for Vietnam. With Singapore, it shares the top spot in East Asia of being a member for bilateral and multilateral free trade agreements. A signatory to 16 bilateral and multilateral free trade agreements, Vietnam is a member of the World Trade Organization, ASEAN, and has concluded bilateral agreements with the U.S., Japan, South Korea, the EU, and the Eurasian Customs Union. Earlier this year, it became one of 11 countries to join the revived CPTPP. These trade agreements dramatically reduced tariffs, anchored difficult domestic reforms, and opened much of the economy to foreign investment. It is estimated that more than 10,000 foreign companies—including major global players such as Samsung, Intel, and LG—operate in Vietnam today, mostly in export-oriented, labor-intensive manufacturing. Second, Vietnam has leveraged its demographic dividend through effective investment in its people. Vietnam’s efforts to promote access to primary education and to ensure its quality through minimum quality standards have paid off. In the latest 2015 OECD Programme for International Student Assessment (PISA)—which tests high school students in math, science, and other disciplines—Vietnam ranked 8th out of 72 participating countries, ahead of OECD countries such as Germany and Netherlands. Third, relentless focus on competitiveness and the ease of doing business. Vietnam has made steady progress in improving its investment climate, as evidenced by higher scores in the World Economic Forum’s competitiveness index (up five points to 55th in the world), and the 2018 World Bank’s ease of doing business ranking (68th in the world, up 31 places since 2014). Vietnam also reduced the corporate income tax rate to 20 percent from 32 percent in 2003. Finally, Vietnam invested in infrastructure, especially in the power sector and connectivity. Thanks in part to high public investment, power generation, transmission, and distribution capacity have been scaled up to meet rapidly rising demand. To keep pace with rapidly growing container trade (which expanded at a staggering average annual rate of 12.4 percent between 2008 and 2016), Vietnam also developed its connective infrastructure, including seaports and marine terminals. Not ones to bask in their glory, Vietnamese prefer to deal with the remaining challenges. Overall, Vietnam’s manufacturing sector remains relatively small. Most of the sector is driven by foreign direct investment (FDI), which accounts for close to 90 percent of manufacturing exports. Many of the newly created jobs in manufacturing are in basic assembly which requires manual labor but does not necessarily add a lot of value (per worker). Linkages between FDI and domestic firms are weak. Moreover, as wages inevitably rise, Vietnam’s current comparative advantage in low-skill, labor-intensive industries will start to dissipate, a trend that may be amplified by new labor-saving technologies and automation. Vietnam’s recent ascension to the ranks of global manufacturing hubs offers lessons on the potential of manufacturing-led growth but also a cautionary tale about its inherent limitations.